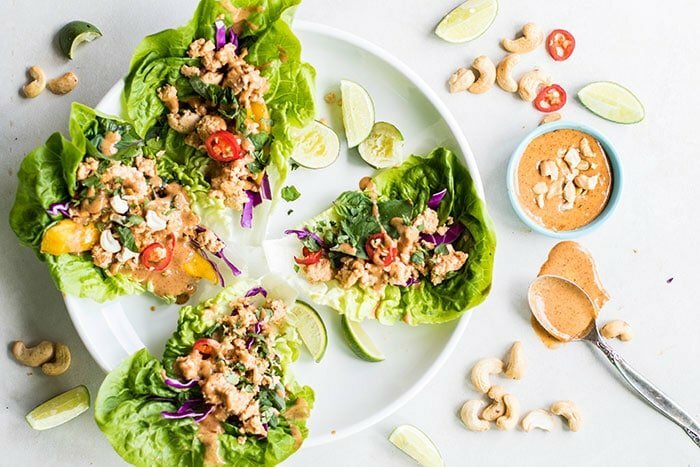 These Thai Chicken Lettuce Wraps are the answer to your take-out cravings. So. much. flavor. The chicken is loaded with ginger, and the creamy almond butter sauce tops it all off. And so healthy, too! Low carb, Paleo, and Whole30 compliant. I did the Whole30 last year, and one of my key take aways was that meals full of nutrient dense foods (proteins, veggies, nuts and seeds, fruit) make me feel the best. Although the Whole30 is too restrictive (for me) to stay on long term (I just don’t like meat enough! 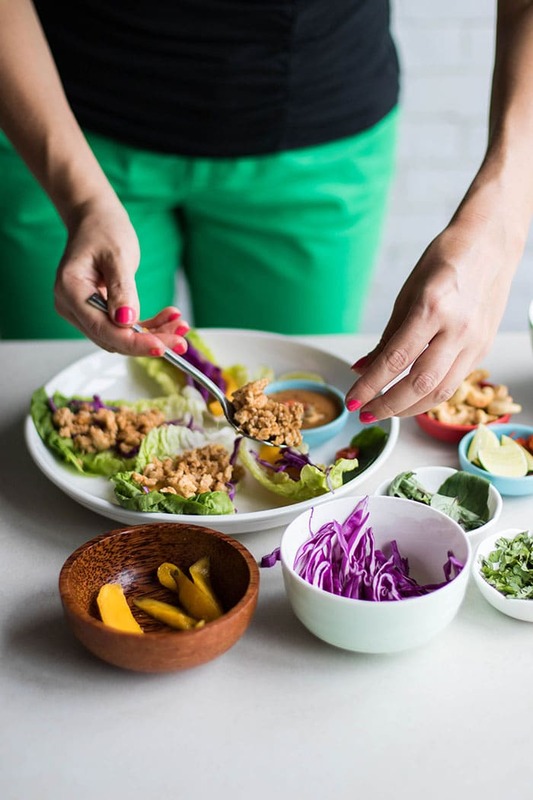 ), I do try to incorporate Whole30 meals daily – whether that’s chia pudding for breakfast, a salad for lunch, or a delicious combination of Thai ingredients wrapped into crunchy lettuce leaves for dinner. Now what makes these magical is the sauce. I am allergic to peanuts, but always thought peanut sauce sounded like a pretty good idea. I started making my own version with almond butter and coconut milk years ago– and holy flavor! The chicken in these wraps is flavor loaded as well. If you’ve tried to make Thai at home, but never quite mastered the flavors, try using Thai shallots! That was a real turning point for me in learning to cook Thai food. To be honest, they are a pain to chop up. They are small, so you have to peel quite a few. And then they are super strong, so they make my eyes burn and tear up. But the flavor is worth it! I run back and forth between the kitchen and bathroom crying, rinsing my eyes out, patting them, and then braving the kitchen again to chop a few more. Maybe it’s time for onion goggles? Did you know those were a “thing?” Well, they are my friends. 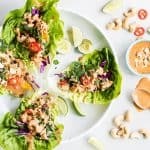 And once you taste these Thai Chicken Lettuce Wraps, you might realize the shame of wearing onion goggles isn’t as great as the joy of eating these. These are so versatile! We also use carrots and red bell pepper in these, or top with toasted almonds instead of the cashews. I bet grilled pineapple would be just as delicious as the mango. I am sure ground turkey would work in place of the chicken. Make it Gluten Free: Be sure to use Tamari (wheat free soy sauce) or Coconut Aminos. Make it Ahead: These make a great party appetizer or option for a weekly meal prep. The chicken is delicious cold in these. Simply prepare all ingredients, and keep the chicken, sauce, and chopped mango and cabbage in separate containers, and assemble when you’re ready to eat. Make it Vegan: Sub chickpeas or tempeh for the chicken and you have a super flavorful vegan meal. Make it Paleo/Whole30: Be sure to use Coconut Aminos, and be sure your chili sauce is compliant. Prepare the chicken by heating sesame oil in a skillet over medium-high heat, and adding ginger and shallots. Cook for 7-10 minutes, until very soft and fragrant. Add ground chicken, and brown. Add sea salt, coconut aminos, and chili sauce to taste. To make the almond sauce, add all ingredients to a blender, and process. You can also do it with a bowl and a small whisk, but it takes a while and it gets smoother in a blender. Chill the almond sauce until ready to use. 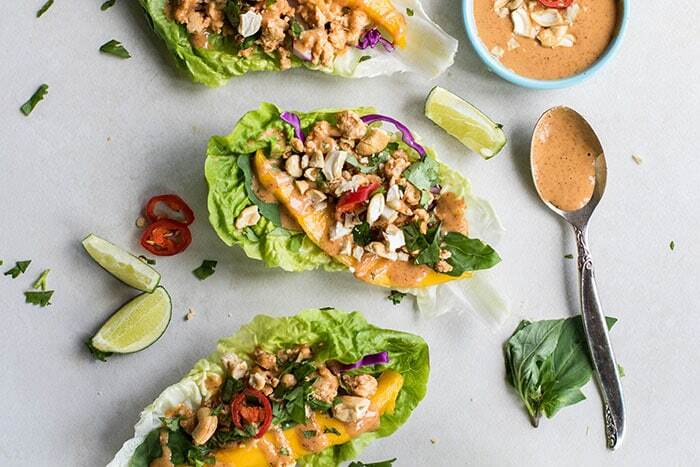 To assemble the wraps, add cabbage, mango, and chicken, and then top with chopped cashews and herbs. Drizzle with spicy Thai almond sauce or serve on the side. These are customizable! We also love red bell pepper and carrots in these. You can also sub peanut butter for the almond butter if you're not allergic. These look delicious and I love all of the suggestions you included for making this recipe gluten free, vegan, etc! I am going to have to try these soon because they look so good! Thanks for sharing! Luci’s Morsels | fashion. food. frivolity. 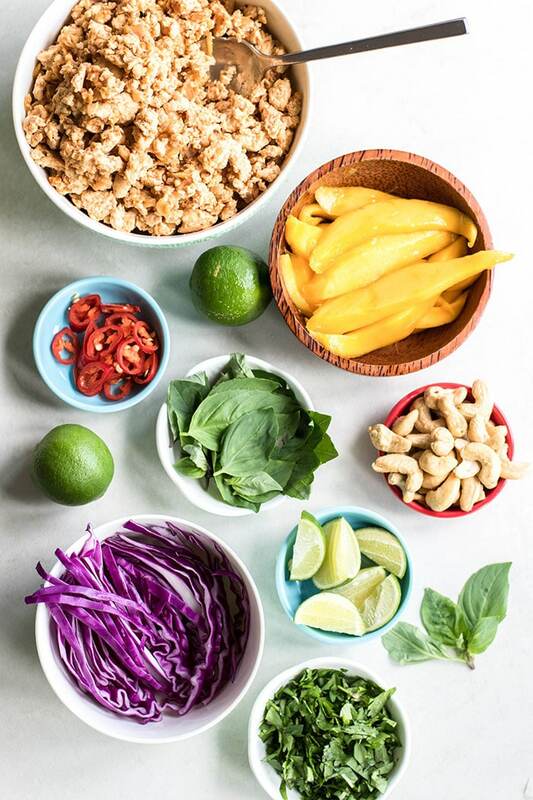 Thanks Luci-- I make lettuce wraps a variety of ways, and of course a recipe like this is really just a guideline! Such an easy healthy meal. These look SOOO delicious! Totally wishing I had these for dinner tonight! So many people are afraid of doing this diet because they think that their meals will be bland. This recipe proves that this certainly isn't the case! It looks delicious! 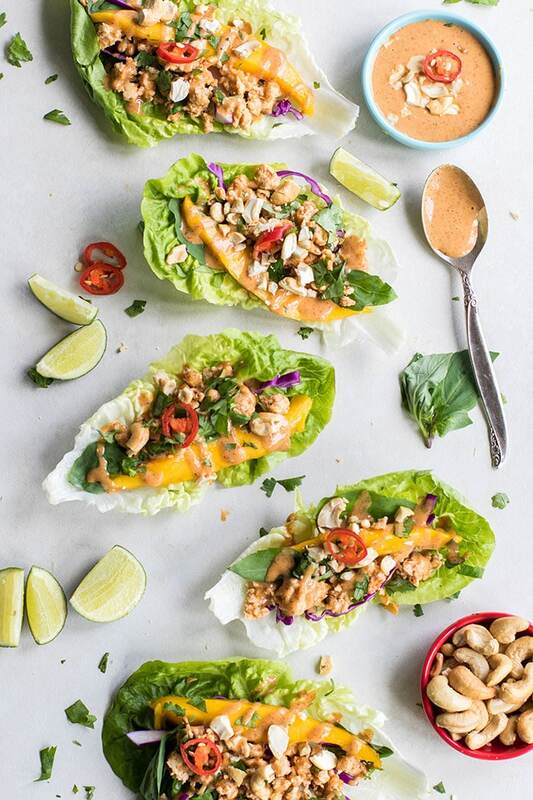 The Whole30 is great for anyone to do just to push them to do interesting things with really healthy ingredients-- because no one could get bored eating these! The perfect Whole 30 recipe. These wraps look so yummy! Thanks Silvia! So sweet. I hope you do try them, they are a favorite. Chicken cooked this way has so much flavor. These look fantastic! I have done two rounds of Whole 30 and am always on the lookout for new ideas to incorporate into my menu planning that are compliant! Can't wait to try these! These are a great thing to add- a meal that doesn't feel like you're doing the Whole30, just delicious. I am thinking of all the things I can cover with the Thai Almond Sauce!!! Exactly! 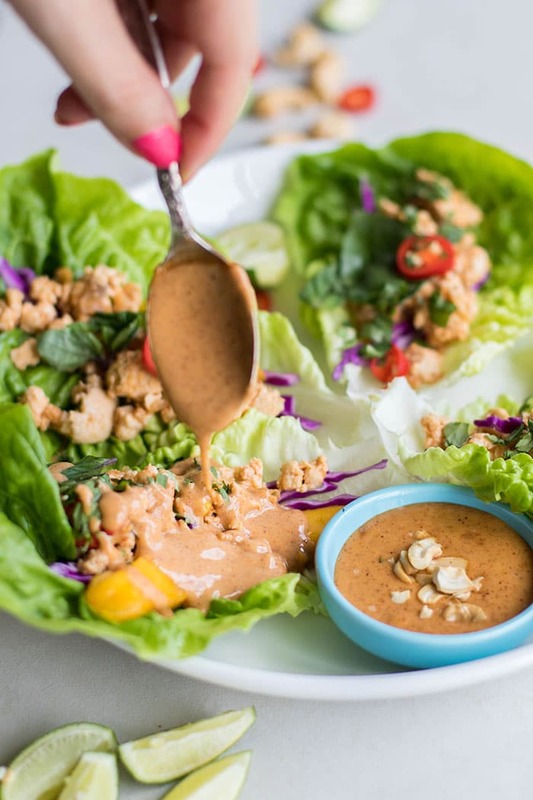 I have a really popular recipe on my site that uses the Thai Almond Sauce plus some extra vinegar and lime, and it turns it into the most addictive salad dressing! This looks delicious!! Pinning for later! That Thai almond sauce is just the icing on the cake so to speak. I would love these for lunch today! I could just eat these everyday! Delicious! Yes, exactly how I like my dinners! And that sauce (and the spices on the chicken) are so flavorful and delicious! These are really good. This is what I do for dishes that requires a wrap, use lettuce instead for a low carb version. Using lettuce as a wrap is very southeast Asia style. What chili sauce are you using that is Whole30? Thank you. I live in Asia, where we can buy chili sauce that is just chilis, salt and vinegar, so that is what I am using. It's actually much better than Sriracha. I am sure you could find something similar at an Asian import store, but I am sorry, I don't have a brand for you!